1. 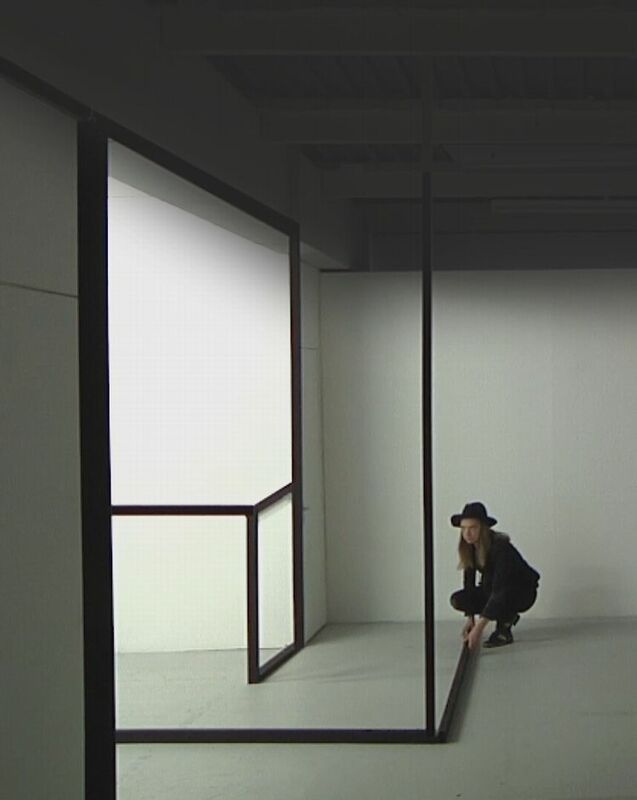 Give us an insight into your upcoming show LIVE | WORK at the arebyte gallery in East London. LIVE | WORK takes its name from the many artists' LIVE | WORK spaces in the local area. The name also references live art and live broadcasting – as the gallery is constantly surveyed and relayed by online cameras. Lastly, the installation has an architectural feel – like I am in the process of designing and building a space in which to live – a half-formed fantasy of an ideal home. 2. Where did the idea for creating this space begin? In the process of its creation, is there a particular mood you wish set for the visitors or a solid message you are trying to communicate ? I had the idea of creating a notional stage set that anyone could enter and that was constantly being broadcast. I had also become interested in people who install cameras in their houses, either for reasons of security, commerce or voyeurism. When I found out the gallery and studios were going to be turned into flats in the next few years, that added another dimension to the idea. 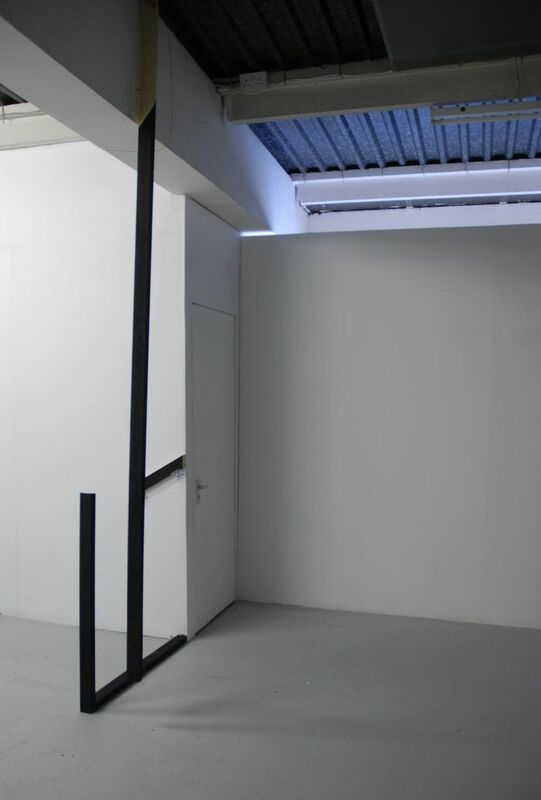 I began working with the notion of foreshadowing the future function of the space by making architectural interventions. I think the show feeds on various personal and (perceived) cultural anxieties about security and visibility, but I also feel that art shouldn't be reducible to a message as such.
" I think that, through art, we can create spaces for thought and experience that wouldn't be able to exist otherwise." 3. How has your interest in negotiating a physical and virtual divide developed over time ? I have always been interested in working with the difference between a ‘real’ space and its mediated double. Social media is, of course, full of people (including myself) curating and manipulating digital images in a way that encourages a certain reading. I feel that virtual space can compensate for the congestion of public space and the disappointments and restrictions of 'real' life. As people own more 'virtual' or digital content, 'real' space becomes increasingly expensive and exclusive. The digital revolution emphasizes access and sharing, but in the real world we have less access to housing, less access to further education etc. Contemporary CGI computers games are full of borderless, bright, self-generating worlds – no wonder they are so appealing.
" Social media is, of course, full of people (including myself) curating and manipulating digital images in a way that encourages a certain reading. I feel that virtual space can compensate for the congestion of public space and the disappointments and restrictions of 'real' life. " 4. Are you optimistic for humanity’s future relationship with technology or quite the opposite ? This is a huge question, but I would say I am pessimistic about how it's likely to be implemented, rather than about the technology itself. 5. How would you describe your work as a whole and where do you think it fits within the sphere of contemporary art ? When people say 'the sphere of contemporary art' I think they are often referring to the art market. When I was young I was interested in experimental film, theatre and writing – I still am, actually. This developed into an interest in performance and installation art at University. These are strategies that have often been used to deliberately evade the kind of commodification that the art market relies on. This has created the tendency for experimental or performance-based practices to be curated in a tokenistic way or else to be separated into isolated spaces or scenes. It's a challenging situation to negotiate. 6. In your opinion, what is the role of the artist in society? There is no job description…it's all up for grabs. Artists have a license to oppose prevailing narratives because their work doesn't (or shouldn't) need to be justified in simple economic, moral or even logical terms. Some artists are like alchemists...converting the distressing and discarded aspects of everyday life into something visible and valuable. I am grateful for people who can do that.
" Artists have a license to oppose prevailing narratives because their work doesn't (or shouldn't) need to be justified in simple economic, moral or even logical terms."